This pet friendly 2 bedroom 50s Red Brick country duplex has just been totally remodeled top to bottom with new comfy beds, located within walking distance to downtown Ballground, such a quaint area with eateries and shops. Cherokee area is known as where Metro meets the mountains because most north metro areas are within 20-25 minuit drive, Big Canoe Mountain resort area only 8mi, Lakes Altoona ,Lanier marina's also close to see both lakes A Perfect location when wanting to see it all! Hi there, my name is Kim and I host this home for my elderly mother , who is unable to live here , so we renovated for a vacation rental so she can still own her home which is very important to her. 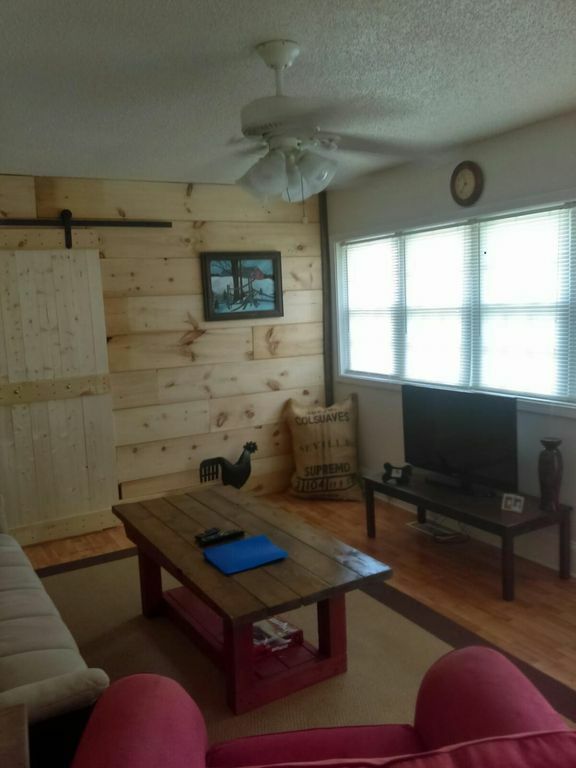 I would describe myself as a laid back, spiritual personality, who loves animals usually more than people most days, we have goats and chickens up in the Gilmer north ga mountains about 1.5 hr away from this rental. Great location when wanting to see metro and Mountain areas. The pleasantries of being in the country. The conveniences of being urban. A true value! We really enjoyed the apartment. I do find the description a little lacking, so I will add some details from my experience. First off, Kimberly responded to all questions and inquiries, with in a matter or minutes, and was a pleasure to deal with. The place is a duplex, but the part that you inhabit, when renting , from what we could tell is like 3 quarters of the entire place. The layout is very. It's open and designed in such a way that you can get from almost any room to any other room. The 2 beds in the bedrooms are extremely comfortable. The furniture in the living room is also very comfortable. One of the bedrooms does have a small flat panel television.. The living room also has a television. It has YouTube, sling, Netflix, and I believe roku.. so there are a lot of options for television viewing. Also, the rental has wi fi, with instructions, how to use it. Additionally, be New Yorkers, we have learned, then we travel most places the phone signal and GPS, we, normally, take for granted may not exist. I, now, purchase maps of everywhere go. It was totally, unnecessary, here. Phone service and gps, in this area were mint. The bathroom is stocked with all the soaps and towels that you could need..
And the shower head is very unique.. I'd sit it has like a 9 inch diameter.. it's kinda like showering in the rain. My wife and I really liked it. The kitchen has all the untencils and pots, etc.. , that you could need, as well as all cooking appliances. And there is a small deck off of the kitchen with comfortable chairs.. I really enjoyed sitting out at night. Everything was very clean, through and through. Downtown ballgrounds is a really cool little area, with some of the nicest people you ll ever meet. It's like a five minute drive from the duplex, and there is a Chevron convenience store, literally a short block from the property. I would highly recommend this rental, especailly for the price, which was very reasonable. We would have paid more for a motel. Was great! Very clean, which is a MUST for me! Had games for the family to play. Was very easy to locate and had places near to eat and shop. There was only 3 of us but was plenty of room for 4 or even 5 if one slept on the couch. The bathroom was a little small but still very clean. We will definitely stay there again. The place is clean, and the contact person is very prompt in responding to questions. We like the layout of the house and are very pleased with our experience. Outstanding Ball Ground place to stay. It was super clean, everything was great.